Hello Linux Geeksters. 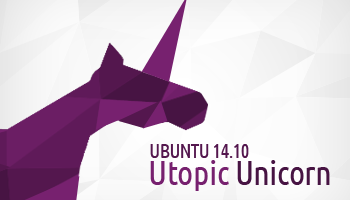 As you may know, Canonical has been working hard at Ubuntu 14.10 Utopic Unicorn, the next generation Ubuntu system. While the Ubuntu 14.10 Alpha 1 release still uses Kernel 3.15, the final version of Ubuntu 14.10, scheduled for release on the 23rd of October, will be running on Kernel 3.16. The Canonical developers have already implemented Kernel 3.16 RC2 as default, on the unstable branch of Ubuntu 14.10 Utopic Unicorn. Ubuntu 14.10 Utopic Unicorn will be an interesting release. The Canonical developers intend to release Ubuntu 14.10 (with Unity) in two flavors: one using Unity 7 and X.org as default, and another one, named “Ubuntu Desktop Next”, powered by Unity 8 and Mir. Also the GNOME2 fans will be very pleased by the release of Ubuntu 14.10. While developers from both Canonical and MATE are working at creating a Mate flavor of Ubuntu 14.10, Cinnamon 2.2 will be available via the default repositories of Ubuntu Utopic. And this is not all. While Ubuntu 14.10 will be still using Upstart as the default init manager, a usable version of systemd will be available for testing.